Select 0, 1 or 2 Numbers from the 'Numbers' Radio List. 2 Numbers are ideal for Tickets, with one number on the Ticket and the other on the stub. 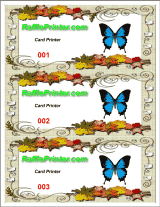 For Cards, Invitations etc, you can use Barcodes or Individually Name Items from a list instead of using numbers. Click the Number on the designer to select it and drag to position. Roll the Mouse-wheel to re-size. Use the Color Selector to change color etc. Right click the number for a context menu to rotate vertical or horizontal and choose padding options (0007 or 007 etc). Add text and drag to position beside the Number(s) if required. eg: 'Ticket Number:', Seat position etc. 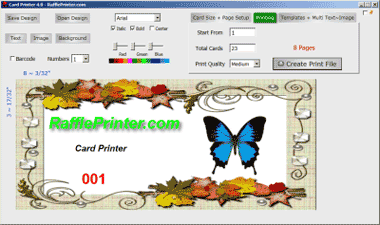 Enter the Number of Items to print and the Start Number. When you hit 'Printing', a print file is created and saved, containing all the Items to be printed. For large print runs (lots of pages), print in batches from this Print File. Make sure you enter a higher number in the 'Items' textbox than you need. You can then always print off more if needed, without having to re-create the design.